Rochester (/ˈrɒtʃɪstər/ ROTCH-iss-tər) is a town and was a historic city in the unitary authority of Medway in Kent, England. It is at the lowest bridging point of the River Medway about 30 miles (50 km) from London. The Romano-British name for Rochester was Durobrivae, later Durobrivis c. 730 and Dorobrevis in 844. The two commonly cited origins of this name are that it either came from "stronghold by the bridge(s)" or is the latinisation of the British word Dourbruf meaning "swiftstream". Durobrivis was pronounced 'Robrivis. In later times, the word cæster (=castle, from Latin castrum) was added to the name and the city was called Robrivis Cæster. Bede mentions the city in ca. 730 and calls it Hrofes cæster, mistaking its meaning as Hrofi's fortified camp. From this we get c. 730 Hrofæscæstre, 811 Hrofescester, 1086 Rovescester, 1610 Rochester. The Latinised adjective 'Roffensis' refers to Rochester. Neolithic remains have been found in the vicinity of Rochester; over time it has been variously occupied by Celts, Romans, Jutes and/or Saxons. During the Celtic period it was one of the two administrative centres of the Cantiaci tribe. During the Roman conquest of Britain a decisive battle was fought at the Medway somewhere near Rochester. The first bridge was subsequently constructed early in the Roman period. During the later Roman period the settlement was walled in stone. King Ethelbert of Kent (560–616) established a legal system which has been preserved in the 12th century Textus Roffensis. In AD 604 the bishopric and cathedral were founded. During this period, from the recall of the legions until the Norman conquest, Rochester was sacked at least twice and besieged on another occasion. The medieval period saw the building of the current cathedral (1080–1130, 1227 and 1343), the building of two castles and the establishment of a significant town. Rochester Castle saw action in the sieges of 1215 and 1264. Its basic street plan was set out, constrained by the river, Watling Street, Rochester Priory and the castle. Rochester has produced two martyrs: St John Fisher, executed by Henry VIII for refusing to sanction the divorce of Catherine of Aragon; and Bishop Nicholas Ridley, executed by Queen Mary for being an English Reformation protestant. The city was raided by the Dutch as part of the Second Anglo-Dutch War. The Dutch, commanded by Admiral de Ruijter, broke through the chain at Upnor and sailed to Rochester Bridge capturing part of the English fleet and burning it. Rochester has for centuries been of great strategic importance through its position near the confluence of the Thames and the Medway. Rochester Castle was built to guard the river crossing, and the Royal Dockyard's establishment at Chatham witnessed the beginning of the Royal Navy's long period of supremacy. The town, as part of Medway, is surrounded by two circles of fortresses; the inner line built during the Napoleonic wars consists of Fort Clarence, Fort Pitt, Fort Amherst and Fort Gillingham. The outer line of Palmerston Forts was built during the 1860s in light of the report by the Royal Commission on the Defence of the United Kingdom and consists of Fort Borstal, Fort Bridgewood, Fort Luton, and the Twydall Redoubts, with two additional forts on islands in the Medway, namely Fort Hoo and Fort Darnet. During the First World War the Short Brothers' aircraft manufacturing company developed the first plane to launch a torpedo, the Short Admiralty Type 184, at its seaplane factory on the River Medway not far from Rochester Castle. In the intervening period between the 20th century World Wars the company established a world-wide reputation as a constructor of flying boats with aircraft such as the Singapore, Empire 'C'-Class and Sunderland. During the Second World War, Shorts also designed and manufactured the first four-engined bomber, the Stirling. The UK's decline in naval power and shipbuilding competitiveness led to the government decommissioning the RN Shipyard at Chatham in 1984, which led to the subsequent demise of much local maritime industry. Rochester and its neighbouring communities were hit hard by this and have experienced a painful adjustment to a post-industrial economy, with much social deprivation and unemployment resulting. On the closure of Chatham Dockyard the area experienced an unprecedented surge in unemployment to 24%; this had dropped to 2.4% of the local population by 2014. Rochester was recognised as a City from 1211 to 1998. The City of Rochester's ancient status was unique, as it had no formal council or Charter Trustees nor a Mayor, instead having the office of Admiral of the River Medway, whose incumbent acted as de facto civic leader. Since Norman times Rochester had always governed land on the other side of the Medway in Strood, which was known as Strood Intra; before 1835 it was about 100 yards (91 m) wide and stretched to Gun Lane. In the 1835 Municipal Corporations Act the boundaries were extended to include more of Strood and Frindsbury, and part of Chatham known as Chatham Intra. Like many of the mediaeval towns of England, Rochester had civic Freemen whose historic duties and rights were abolished by the Municipal Corporations Act 1835. However, the Guild of Free Fishers and Dredgers continues to the present day and retains rights, duties and responsibilities on the Medway, between Sheerness and Hawkwood Stone. This ancient corporate body convenes at the Admiralty Court whose Jury of Freemen is responsible for the conservancy of the River as enshrined in current legislation. The City Freedom can be obtained by residents after serving a period of "servitude", i.e. apprenticeship (traditionally seven years), before admission as a Freeman. The annual ceremonial Beating of the Bounds by the River Medway takes place after the Admiralty Court, usually on the first Saturday of July. For parishes in the wider Rochester area, see Strood § Churches, and Frindsbury § The Church of All Saints. There were three medieval parishes: St Nicholas', St Margaret's and St Clement's. St Clement's was in Horsewash Lane until the last vicar died in 1538 when it was joined with St Nicholas' parish; the church's last remaining foundations were finally removed when the railway was being constructed in the 1850s. St Nicholas' Church was built in 1421 beside the cathedral to serve as a parish church for the citizens of Rochester. The ancient cathedral included the Benedictine monastic priory of St Andrew with greater status than the local parishes. Rochester's pre-1537 diocese, under the jurisdiction of the Church of Rome, covered a vast area extending into East Anglia and included all of Essex. As a result of the restructuring of the Church during the Reformation the cathedral was reconsecrated as the Cathedral Church of Christ and the Blessed Virgin Mary without parochial responsibilities, being a diocesan church. In the 19th century the parish of St Peter's was created to serve the burgeoning city with the new church being consecrated in 1859. Following demographic shifts, St Peter's and St Margaret's were recombined as a joint benefice in 1953 with the parish of St Nicholas with St Clement being absorbed in 1971. The combined parish is now the "Parish of St Peter with St Margaret", centred at the new (1973) Parish Centre in The Delce (St Peter's) with St Margaret's remaining as a chapel-of-ease. Old St Peter's was demolished in 1974, while St Nicholas' Church has been converted into the diocesan offices but remains consecrated. Continued expansion south has led to the creation of an additional more recent parish of St Justus (1956) covering The Tideway estate and surrounding area. A church dedicated to St Mary the Virgin at Eastgate, which was of Anglo-Saxon foundation, is understood to have constituted a parish until the Middle Ages, but few records survive. On 1 April 1974, the City Council was abolished under the Local Government Act 1972, and the territory was merged with the District of Medway, Borough of Chatham and most of Strood Rural District, including the parishes of Cuxton, Halling and Cliffe, and the Hoo Peninsula, to form a new a local government district called the Borough of Medway, within the county of Kent. Medway Borough Council applied to inherit Rochester's city status, but this was refused; instead letters patent were granted constituting the area of the former Rochester local government district to be the City of Rochester, to "perpetuate the ancient name" and to recall "the long history and proud heritage of the said City". The Home Office said that the city status may be extended to the entire borough if it had "Rochester" in its name, so in 1979, Medway Borough Council renamed the borough to Borough of Rochester-upon-Medway, and in 1982, Rochester's city status was transferred to the entire borough by letters patent, with the district being called the City of Rochester-upon-Medway. The Admiral of the River Medway was ex-officio Mayor of Rochester and this dignity transferred to the Mayor of Medway when that unitary authority was created, along with the Admiralty Court for the River which constitutes a committee of the Council. On 1 April 1998, the existing local government districts of Rochester-upon-Medway and Gillingham were abolished and became the new unitary authority of Medway. The Department of Environment, Transport and the Regions informed the city council that since it was the local government district that officially held City status under the 1982 Letters Patent, the council would need to appoint charter trustees to preserve its city status, but the outgoing Labour-run council decided not to appoint "Charter Trustees", so the city status was lost when Rochester-upon-Medway was abolished as a local government district. The other local government districts with City status that were abolished around this time, Bath and Hereford, decided to appoint Charter Trustees to maintain the existence of their own cities and the mayoralties. The incoming Medway Council apparently only became aware of this when, in 2002, it was advised that Rochester was not on the Lord Chancellor's Office's list of cities. In 2010, Medway Council started to refer to the "City of Medway" in promotional material, but it was rebuked and instructed not to do so in future by the Advertising Standards Authority. Subsequently, the Medway Unitary Authority has applied for City status for Medway as a whole, rather than merely for Rochester. Medway applied unsuccessfully for City status in 2000 and 2002 and again in the Queen's Diamond Jubilee Year of 2012. Any future bid to regain formal City status has been recommended to be made under the aegis of Rochester-upon-Medway. The 2011 definition of Rochester includes Strood to the northwest and is defined as an urban subdivision with a 2011 population of 62,982. Kelly Tolhurst MP is the current parliamentary representative for the constituency. Rochester lies within the area, known to geologists, as the London Basin. The low-lying Hoo peninsula to the north of the town consists of London Clay, and the alluvium brought down by the two rivers—the Thames and the Medway—whose confluence is in this area. The land rises from the river, and being on the dip slope of the North Downs, this consists of chalk surmounted by the Blackheath Beds of sand and gravel. As a human settlement, Rochester became established as the lowest river crossing of the River Medway, well before the arrival of the Romans. It is a focal point between two routes, being part of the main route connecting London with the Continent and the north-south routes following the course of the Medway connecting Maidstone and the Weald of Kent with the Thames and the North Sea. The Thames Marshes were an important source of salt. Rochester's roads follow north Kent's valleys and ridges of steep-sided chalk bournes. There are four ways out of town to the south: up Star Hill, via The Delce, along the Maidstone Road or through Borstal. The town is inextricably linked with the neighbouring Medway Towns but separate from Maidstone by a protective ridge known as the Downs, a designated area of Outstanding Natural Beauty. At its most limited geographical size, Rochester is defined as the market town within the city walls, now associated with the historic medieval city. However, Rochester historically also included the ancient wards of Strood Intra on the river's west bank, and Chatham Intra as well as the three old parishes on the Medway's east bank. The diocese of Rochester is another geographical entity which can be referred to as Rochester. Rochester has an oceanic climate similar to much of southern England, being accorded Köppen Climate Classification-subtype of "Cfb" (Marine West Coast Climate). On 10 August 2003, neighbouring Gravesend recorded one of the highest temperatures since meteorogical records began in the United Kingdom, with a reading of 38.1 degrees Celsius (100.6 degrees Fahrenheit), only beaten by Brogdale, near Faversham, 22 miles (35 km) to the ESE. The weather station at Brogdale is run by a volunteer, only reporting its data once a month, whereas Gravesend, which has an official Met Office site at the PLA pilot station, reports data hourly. Being near the mouth of the Thames Estuary with the North Sea, Rochester is relatively close to continental Europe and enjoys a somewhat less temperate climate than other parts of Kent and most of East Anglia. It is therefore less cloudy, drier and less prone to Atlantic depressions with their associated wind and rain than western regions of Britain, as well as being hotter in summer and colder in winter. Rochester city centre's micro-climate is more accurately reflected by these officially recorded figures than by readings taken at Rochester Airport. North and North West Kent continue to record higher temperatures in summer, sometimes being the hottest area of the country, eg. on the warmest day of 2011, when temperatures reached 33.1 degrees. Additionally, it holds at least two records for the year 2010, of 30.9 degrees and 31.7 degrees C. Another record was set during England's Indian summer of 2011 with 29.9 degrees C., the highest temperature ever recorded in the UK for October. Rochester comprises numerous important historic buildings, the most prominent of which are the Guildhall, the Corn Exchange, Restoration House, Eastgate House, as well as Rochester Castle and Rochester Cathedral. Many of the town centre's old buildings date from as early as the 14th century up to the 18th century. The chapel of St Bartholomew's Hospital dates from the ancient priory hospital's foundation in 1078. Thomas Aveling started a small business in 1850 producing and repairing agricultural plant equipment. In 1861 this became the firm of Aveling and Porter, which was to become the largest manufacturer of agricultural machinery and steam rollers in the country. Aveling was elected Admiral of the River Medway (i.e. Mayor of Rochester) for 1869-70. Since 1980 the city has seen the revival of the historic Rochester Jack-in-the-Green May Day dancing chimney sweeps tradition, which had died out in the early 1900s. Though not unique to Rochester (similar sweeps' gatherings were held across southern England, notably in Bristol, Deptford, Whitstable and Hastings), its revival was directly inspired by Dickens' description of the celebration in Sketches by Boz. The festival has since grown from a small gathering of local Morris dance sides to one of the largest in the world. The festival begins with the "Awakening of Jack-in-the-Green" ceremony, and continues in Rochester High Street over the May Bank Holiday weekend. There are numerous other festivals in Rochester apart from the Sweeps Festival. The association with Dickens is the theme for Rochester's two Dickens Festivals held annually in June and December. The Medway Fuse Festival usually arranges performances in Rochester and the latest festival to take shape is the Rochester Literature Festival, the brainchild of three local writers. A new public library was built alongside the Adult Education Centre, Eastgate. This enabled the registry office to move from Maidstone Road, Chatham into the Corn Exchange on Rochester High Street (where the library was formerly housed). As mentioned in a report presented to Medway Council's Community Services Overview and Scrutiny Committee on 28 March 2006, the new library opened in late summer (2006). A new Huguenot Museum, which includes items from the collections of the French Hospital, was opened in Rochester on 13 May 2015, with support from the Heritage Lottery Fund and individual donations. There is a small amateur theatre called Medway Little Theatre on St Margaret's Banks next to Rochester High Street opposite the former railway station. The theatre was formed out of a creative alliance with the Medway Theatre Club, managed by Marion Martin, at St Luke's Methodist Church on City Way, Rochester between 1985 and 1988, since when drama and theatre studies have become well established in Rochester owing to the dedication of the Medway Theatre Club. Local newspapers for Rochester include the Medway Messenger, published by the KM Group, and free papers. The local commercial radio station for Rochester is KMFM Medway, owned by the KM Group. Medway is also served by community radio station Radio Sunlight which is now an online service. The area also receives broadcasts from county-wide stations BBC Radio Kent, Heart and Gold, as well as from various Essex and Greater London radio stations. Rochester is part of the ITV Meridian and BBC South East area, receiving television signals from the Bluebell Hill transmitter on the crest of the North Downs to the SE, supplemented by a low power relay transmitter in central Chatham. Football is played with many teams competing in Saturday and Sunday leagues. The local football club is Rochester United F.C. Rochester F.C. was its old football club but has been defunct for many decades. Rugby is also played; Medway R.F.C. play their matches at Priestfields and Old Williamsonians is associated with Sir Joseph Williamson's Mathematical School. Cricket is played in the town, with teams entered in the Kent Cricket League. Holcombe Hockey Club enter teams in both the Men's and Women's England Hockey Leagues. Speedway was staged on a track adjacent to City Way that opened in 1932. Proposals for a revival in the early 1970s did not materialise and the Rochester Bombers became the Romford Bombers. Sailing and rowing are also popular on the River Medway with respective clubs being based in Rochester. The 1959 James Bond Goldfinger describes Bond driving along the A2 through the Medway Towns from Strood to Chatham. Of interest is the mention of "inevitable traffic jams" on the Strood side of Rochester Bridge, the novel being written some years prior to the construction of the M2 motorway Medway bypass. Rochester is the setting of the controversial 1965 Peter Watkins television film The War Game, which depicts the town's destruction by a nuclear missile. The opening sequence was shot in Chatham Town Hall, but the credits particularly thank the people of Dover, Gravesend and Tonbridge. The 2011 adventure film Ironclad (dir. Jonathan English) is based upon the 1215 siege of Rochester Castle. There are however a few areas where the plot differs from accepted historical narrative. The historic city was for many years the favourite of Charles Dickens, who lived within the diocese at nearby Gads Hill Place, Higham, many of his novels being based on the area. Descriptions of the town appear in Pickwick Papers, Great Expectations and (lightly fictionalised as "Cloisterham") in The Mystery of Edwin Drood. Elements of two houses in Rochester, Satis House and Restoration House, are used for Miss Havisham's house in Great Expectations, Satis House. The actress Dame Sybil Thorndike and her brother Russell were brought up in Minor Canon Row adjacent to the cathedral; the daughter of a canon of Rochester Cathedral, she was educated at Rochester Grammar School for Girls. A local doctors' practice, local dental practice and a hall at Rochester Grammar School are all named after her. Sir Peter Buck was Admiral of the Medway in the 17th century; knighted in 1603 he and Bishop Barlow hosted King James, the Stuart royal family and the King of Denmark in 1606. A civil servant to The Royal Dockyard and Lord High Admiral, Buck lived at Eastgate House, Rochester. Major-General Denis Redman, a World War II veteran, was born and raised in Rochester and later became a founder member of REME, head of his Corps and a Major-General in the British Army. The model and actress Kelly Brook went to Delce Junior School in Rochester and later the Thomas Aveling School (formerly Warren Wood Girls School). For a full list of schools serving Rochester, see List of schools in Medway. Medway and Kent run a selective system of education, but call their secondary modern schools, aka High Schools. Almost all the secondary schools in Rochester have opted for Academy status. In 1701 Sir Joseph Williamson left a bequest to establish the Mathematical School. Unlike earlier educational foundations, such as The King's School it was not tied to a religious establishment but was opened for practical instruction. The University for the Creative Arts, formerly the Kent Institute of Art & Design, is located on the boundary of Rochester with Chatham. the rail tracks run along a viaduct. Rochester is on the A2, which crosses the Medway at Rochester Bridge – the route roughly follows the ancient road known as Watling Street, which before the Normans was used by the Celts, Romans and Ango-Saxons. Nowadays vehicular traffic is diverted onto the nearby M2 motorway. Watling Street passes through the town, and slightly to the south the M2 motorway and the High Speed 1 railway line bridge the River Medway. Bus services are operated by Arriva Southern Counties, which took over the locally owned Maidstone & District bus company in the 1990s. Other local bus companies including Nu-Venture provide certain services, some contracted from the local council. Rochester railway station is on the Chatham Main Line and the North Kent Line. Strood railway station is on the North Kent Line and the Medway Valley Line; it links to the HS1 high speed line at Ebbsfleet International giving a running time of 30 minutes into St Pancras. All services are provided by Southeastern. Rochester Airport began in September 1933 when Rochester City Council purchased some land as the site for a municipal airport. One month later the aircraft manufacturers Short Brothers leased the land for test flying. By 1934–5 Short Brothers had taken over the site, and moved in some of their personnel from the existing seaplane works. The inaugural flight into Rochester was from Gravesend, John Parker flying the Short Brothers Short Scion G-ACJI. In 1979 the lease reverted to the City Council. After giving thorough consideration to closing the airport, GEC (then comprising Marconi and instrument makers Elliot Automation) decided to take over management of the airport. It maintained two grass landing strips while releasing some land for light industrial expansion. ^ "Gads Hill Place - Discover Gravesham". www.discovergravesham.co.uk. ^ "King's Rochester - First Rate Independent Education". www.kings-rochester.co.uk. ^ "English Heritage Rochester Castle". English-heritage.org.uk. Retrieved 1 September 2010. ^ "Medway Council – Local history: Medway in the 20th century 1901 – 2000". web.archive.org. 2009. Archived from the original on 9 March 2009. Retrieved 9 June 2012. ^ "Lieutenancies Act 1997". legislation.gov.uk. 2012. Retrieved 9 June 2012. ^ a b Kelly's Directory of Rochester 1951. ^ "Fortified Places > Fortresses > Upnor Castle". www.fortified-places.com. ^ *The Dutch Raid, published by the City of Rochester Society 1998. ^ "Chatham Dockyard closure 'very positive for the area'". 31 March 2014 – via www.bbc.co.uk. ^ "Houses of Benedictine monks: The cathedral priory of St Andrew, Rochester - British History Online". www.british-history.ac.uk. ^ "Weddings". Rochester Cathedral. Archived from the original on 22 July 2011. Retrieved 2 September 2011. ^ "St Margaret's Parish". Archived from the original on 2 April 2012. Retrieved 9 September 2011. ^ "Rochester Diocese". Rochester.anglican.org. Archived from the original on 26 September 2011. Retrieved 2 September 2011. ^ "www.rbt.org.uk". Archived from the original on 24 September 2015. Retrieved 5 February 2019. ^ "www.medway.gov.uk". Archived from the original on 21 December 2014. Retrieved 21 December 2014. ^ "Error costs Rochester city status". BBC News. 16 May 2002. Retrieved 2 September 2011. ^ "Town seeks to regain city status". BBC News. 17 July 2008. Retrieved 2 September 2011. ^ "Medway City bid aims to bring city status back to the area". Eastern Daily Press. Archant Community Media. 1 June 2011. Archived from the original on 11 April 2015. Retrieved 11 April 2015. ^ Bowen, Mark (4 March 2004). Rochester City Status (PDF) (Report). Medway Council. Archived (PDF) from the original on 27 October 2014. Retrieved 11 April 2015. ^ Hicks, Richard (25 November 2010). City Status Report (Report). Medway Council. Archived from the original on 11 April 2015. Retrieved 11 April 2015. ^ "Adjudication on Medway Council". Advertising Standards Authority. 16 March 2011. Retrieved 28 March 2012. ^ "Medway Council in Kent makes bid for 2012 city status". BBC News. 24 March 2010. Retrieved 2 September 2011. ^ "The city and liberty of Rochester: The city parishes - British History Online". www.british-history.ac.uk. ^ "Gravesend, England Köppen Climate Classification (Weatherbase)". Weatherbase. ^ 2003: Britain swelters in record heat. http://www.bbc.co.uk 10 August 2003. Retrieved on 28 January 2012. ^ 2003 weather summaries. Met Office. Retrieved on 28 January 2012. ^ "Gravesend weather forecast". Met Office. ^ 27 June 2010 Britain basks, but showers due. http://www.news.uk.msn.com Archived 28 September 2014 at the Wayback Machine (28 June 2010). Retrieved on 28 January 2012. ^ Attewill, Fred. (14 October 2011) Weekend hot weather saw Brits flocking to the beaches. Metro.co.uk. Retrieved on 28 January 2012. ^ "Search for events, activities and exhibitions across Kent". Archived from the original on 21 December 2014. Retrieved 21 December 2014. ^ "Thousands turn out for Sweeps Festival". ^ Historic uk – heritage of britain accommodation guide (6 June 2010). "Destinations UK – Rochester, Kent, England". Historic UK. Retrieved 1 September 2010. ^ "Fuse Festival – Come party with us". fusefestival.org.uk. ^ "Rochester Literature Festival". Rochester Literature Festival. ^ "www.visitmedway.org". Archived from the original on 21 December 2014. Retrieved 21 December 2014. ^ Website of the Huguenot Museum, Rochester, Kent, located not far from the French Hospital itself. ^ "Medway Little Theatre". Archived from the original on 16 April 2012. Retrieved 31 January 2012. ^ "St Luke's - Gillingham Methodist Church - NKMC". www.medwaymethodistchurch.org.uk. Archived from the original on 28 December 2014. Retrieved 28 December 2014. ^ "Medway Theatre Club". Archived from the original on 22 December 2014. Retrieved 28 December 2014. ^ radionow. "radio-now.co.uk - Kent, Surrey and Sussex radio stations". www.radio-now.co.uk. ^ "Rochester and District Football League - Home Page". www.leaguewebsite.co.uk. ^ "oldwilliamsonianclub.com – oldwilliamsonianclub.com". www.oldwilliamsonianclub.com. ^ "Holcombe Hockey Club". www.holcombehc.org.uk. ^ "EHL league tables". Archived from the original on 21 December 2014. Retrieved 18 March 2013. ^ "Medway Yacht Club". Medway Yacht Club. ^ "War Game, The". Museum.tv. 31 July 1985. Retrieved 1 September 2010. ^ Judith Bastide (1 April 2013). Follow These Writers. Author House. p. 97. ^ "Dame Sybil Thorndike Practice". Retrieved 30 October 2011. ^ "Thorndike Dental Practice". Retrieved 30 October 2011. ^ "Thorndike Arts Centre, Rochester". thelondonquartet.blogspot.co.uk. ^ "University for the Creative Arts - UCA Rochester - UCA". University for the Creative Arts. 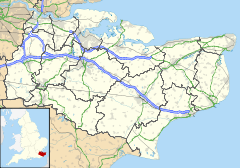 Wikimedia Commons has media related to Rochester, Kent.